We call flare the phase when technically the plane is airborn and goes down to the ground to land. This phase is often the first difficult obstacle in a pilot training. It needs several hours to be overcome. I am proposing here to explain a technique (among others) to handle this phase. 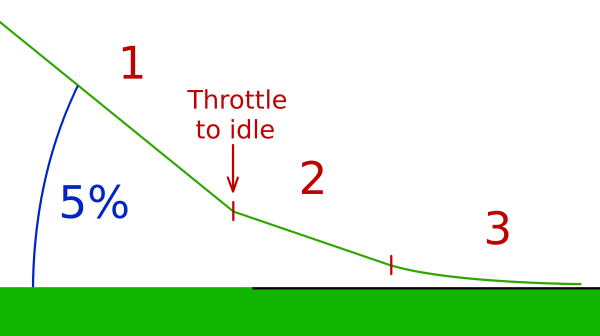 The purpose of the flare is to land the aircraft on the runway touching with the main gear first, with a low speed, and the lowest vertical velocity possible (if the vertical velocity is high, you could damage your landing gear). First, to handle this, you have to do a good work on the final approach. That is to say you have to approach the runway at the right height, on the axis (the extended centerline of the runway), at the correct speed and with the right pitch trimed with accuracy. Phase 1 : it is the final. Phase 2 : you go idle and increase slightly your pitch. This will help you feel the effect of a slight change of your pitch on your vertical velocity, that could help you calibrate the amplitude of the actions you will take afterward. Phase 3 : it is the flare. You are approaching the ground as the speed decreases. The more you get close to the ground, the more you slow down your vertical velocity (until you fly almost parallel to the ground). You control your vertical velocity by accelerating or decelerating the rate of your pitch increase. Do you remember that, in the chapter about trajectories, we have seen that the lift is created by both the speed and the angle of attack ? During the flare the speed is decreasing faster and faster; therefore the lift value is decreasing faster and faster. Thus, if you want to keep a constant vertical velocity, you will have to increase the angle of attack faster and faster (piloting your pitch) to keep the total lift constant. If you increase your pitch too slowly, you won't get back the lift lost from the decrease of the speed, which will result in a lower total lift. If you continue like this, your vertical velocity will increase more and more. You can control your descending vertical velocity thanks to the rate at which you increase the pitch. During the flare phase, if you notice that your descending vertical velocity is actually too low, just stop the increase of your pitch. The common error is to go pitch down pushing the stick forward. If you proceed this way, your lift will decrease very quickly (speed + pitch down) and so your descending vertical velocity will increase very quickly and you could hit the runway badly. Keep in mind that the flare is not a short phase when you apply quickly the same pressures on the stick each time, but a long phase during which you have the time to pilot smoothly according to the following factors : the speed, the height and the vertical velocity. In every case, if you feel you have got off to a bad start, or if you have a wrong feeling, go around. Well ! I confess that the explanation of the flare is quite difficult to assimilate. Nevertheless, understanding some principles here could be useful to better apprehend this phase in flight. But don't worry! There are many trainings planned for this part. Voila ! I have finished with this course. I hope you have enjoyed it! See you up in the air!